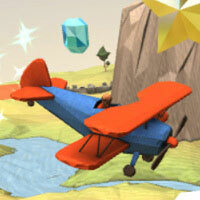 3D airplane flying game for cell phones to play online. Play as an airplane pilot and fly through a beautiful 3D world. Collect gems and stars during the way for higher score. Avoid crashing into clouds and ground.